and a new Olympic cycle!!! The time that has elapsed since I’ve last updated you all has marked the start of training for a new season, the final days of my high school education, and a few other fresh starts. When I left you last, I was about to go to the US Team Spring Training Camp in Squaw Valley, CA. Just a few days following my last journal entry, I departed from Park City in the early hours of the morning to take the AP Literature and Composition exam at a high school in Salt Lake City before boarding a quick flight to California for this spring training trip. (Fun fact: The first preparation camp of the year also marked my first time ever skiing in California!!) This spring camp gave me the opportunity to solely work on my turn technique, try out new drills, continue to eliminate a few lingering bad habits, and work towards one of my bigger skiing goals for the year: straightening out my line (i.e. making my skiing faster, more aggressive and dynamic) while keeping the execution super clean. Skiing at a turns-specific camp was also extraordinarily beneficial for me, as focusing solely on the weaker part of my run will make the entirety much better when I get to bigger camps on full-course venues such as Zermatt and Kaprun. Below is a video from camp!! After returning home from Squaw, my biggest focuses swiveled to finishing out the remaining weeks of high school — filled with essays, final projects, and final exams — and the start of water ramp season, where I begun my summer journey of jump touch-ups and improving newer tricks. Here’s a bit of water ramp video! Once the end-of-year workload and accompanying responsibilities subsided, my family and I traveled to Palo Alto, CA to attend my high school graduation from Stanford University Online High School. The weekend was pretty crazy — as I had the opportunity to finally meet the majority of my classmates in person, though I had seen them “on camera,” or during virtual class time, for the previous three years. The weekend was dedicated to celebrating the Class of 2018’s hard work through various activities and events (one of which was prom)!! Here are some of my favorite pictures from the weekend. Before moving on, I do have to say that it was an honor to be a part of the remarkable Stanford OHS Class of 2018, filled to capacity with students with exceptional academic accolades, out-of-this-world extracurriculars, and hearts brimming with kindness, generosity and compassion. I can’t wait to see where the future takes each and every one of my peers. Though my high school experience may have been “different” than that of the average teenager, I wouldn’t trade it for the world!! Stanford OHS has shaped me as an individual in so many ways, expanding my horizons — academic, physical, and emotional. The lessons I’ve learned from OHS, which apply within countless contexts, have provided me with the necessary tools to tackle my future. A MASSIVE thank you goes out to my family, who gave me the opportunity to pursue the untraditional with full belief in my potential. I am incredibly thankful that most of my grandparents (in addition to immediate family) were able to attend my high school graduation; it meant a lot to me that they were there to witness even a brief moment of the community I have been a member during the previous three years. Immediately after my high school graduation, my ski bag and I traveled directly from California to Mount Hood, OR, for the first of three on-snow camps that will take place at Hood this summer. This camp solely focused upon jumps! While on snow, I focused on improving a few tricks already in my arsenal, as well as completing a new trick on snow (cork 7)!! 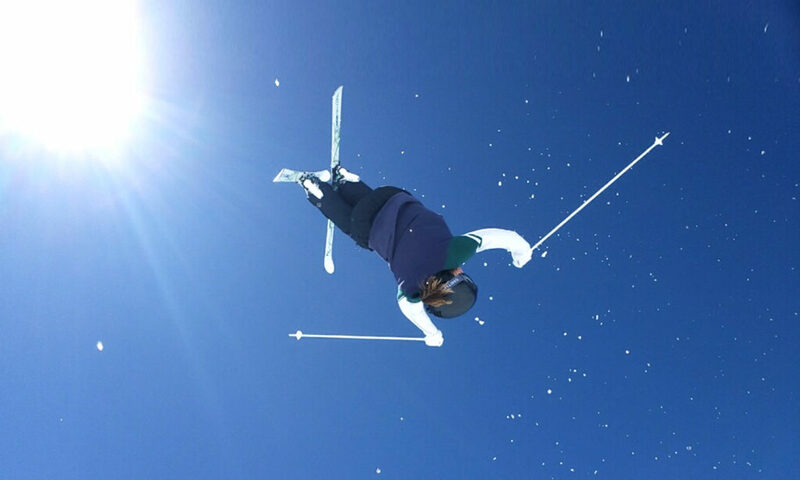 This trick is a vital part of my goal to push the women’s side of moguls; I’m ecstatic to see how it will develop within my competition run as I complete more repetitions on snow. After the week-long camp in Mount Hood, I returned to Park City to meet up with my family to begin our road trip from Utah to California, where we had the opportunity to explore Zion National Park in Utah, and Malibu, Santa Monica and Santa Barbara in California. This bit of time off-snow spent with my family was absolutely rejuvenating; though the time I spend with them has been cut short these past few years due to my consistent travel and involvement within mogul skiing, I have enjoyed the time we do spend together more and more.